I was a little under the weather and teetotaling last week, and so I found myself late this weekend with a decision. I could take a week off from our little weekly get together. I could make a drink exactly once or maybe twice and call it a day…something I really don’t like to do. Or, I could fall back on a drink I frequently make that I somehow haven’t written up here before. In the early days of this feature, I’ve naturally devoted a post to the standard Manhattan, perhaps the second most basic modern day cocktail after a Martini. I’ve also featured the little made Dry Manhattan. I’ve even indulged in a Paris Manhattan. However, while I’ve often referred to the potentially perfect Perfect Manhattan, I’ve never actually devoted a post on it until now. There’s no excuse. 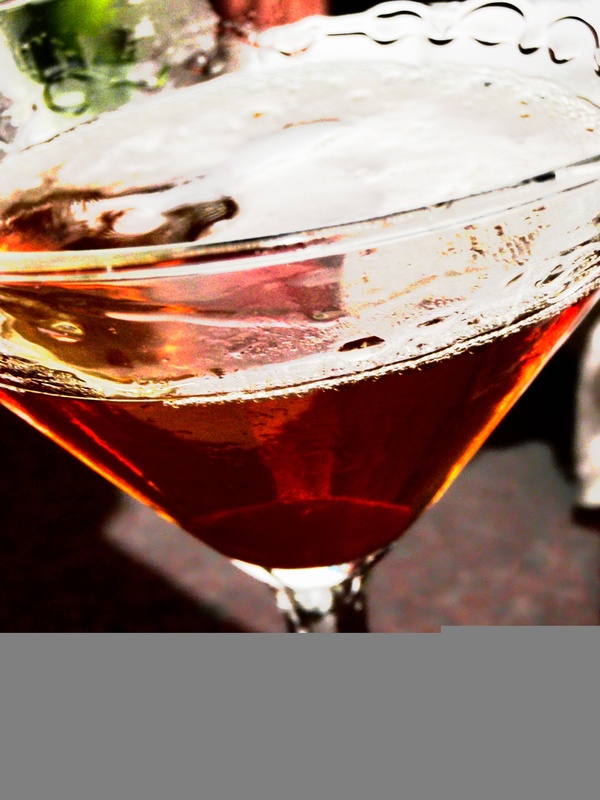 While a regular Manhattan relies on the marriage between the sweetness of whiskey and sweet vermouth, and a Dry Manhattan is based on the counterpoint between whiskey and dry vermouth, the Perfect Manhattan splits the difference. When it comes together just right, it’s a beautiful thing. Combine all the liquid ingredients in your friendly neighborhood cocktail shaker or mixing glass. Shake or stir, as is your preference, and strain into a cocktail glass. Add the garnish of your choice and contemplate the impossibility of consistent perfection and the occasional cocktail that very nearly achieves it. I only had time to make this a few ways…and even that was partly because I kept failing and making drinks that I deemed not quite up to snuff. To put it simply, I’m currently wondering whether bourbon is really the best choice for this drink. I’ve had great success in the past making Perfect Manhattans with good old Canadian Club, with its mild flavor and hint of rye. This weekend, I had an absolutely fantastic result using Redemption Rye, but none of my bourbon attempts quite measured up. It was perhaps unsurprising that 100 proof Knob Creek was a bit overwhelming in such a delicate concoction, but I only sorta kinda liked my results using 80 proof (and really good) Basil Hayden. Although bourbon is sweeter than rye, for some reason the drink always wound up with a bitter edge that was more acrid than invigorating. I also messed around a bit with a choice of bitters. I have had more success in the past using orange bitters than traditional aromatic bitters, i.e., Angostura. This time, however, I decided to go aromatic, but I alternated between Angostura and Fee Brother’s kinder and gentler aromatic bitters, and I declare the bros the winners. This is a drink that calls for gentler flavors. So, this variation on an eternal classic is nowhere near as surefire as a traditional Manhattan, but when it works, it works. The slightly sweet flavors dance across your tongue and engage with the woody complexity inherent in even a merely decent whiskey. And, if a dry Manhattan is just too dry for you, and a regular Manhattan is just too sweet, then a well calibrated Perfect Manhattan may very well be almost kind of nearly just about perfect.